On several recent occasions, we've discussed the merits of bio-pics which focus on a well-known subject versus those that choose a more obscure person as their topic. I contend that the latter is more intriguing. Sure, it's great to see something like Elvis & Nixon or Steve Jobs and learn some new or obscure tidbits about something who has basked in the public eye (These movies can arm you with nice factoids to drop at a social function). However, I prefer checking out movies which throw the spotlight on someone that I've never heard of. In many cases, these are fascinating people who lived important lives or contributed to society in some way. The important thing is that these films grasp the fact that we aren't familiar with the subject and proceed accordingly. Lets they make some of the mistakes seen in The Man Who Knew Infinity. Srinivasa Ramanujan (Dev Patel) is a young man who lives in Madras, India. He is a mathematical genius, but as he doesn't have formal schooling, he scribbles his formulas in notebooks, or uses chalk to draw them on the ground. He's taken his work to local scholars, but due to his station in life, he's dismissed. He takes a job for Sir Francis Spring (Stephen Fry), an Englishman, who sends Ramanujan's work to G.H. Hardy (Jeremy Irons) at Trinity College in Britain. At first, Hardy believes the work to be a hoax, but when he realizes that it is genuine, he sends for Ramanujan. Leaving his wife and mother, the young man travels to England to fulfill his dream of having his work published. But, he's quickly stymied by the world of academia, where he's asked to explain his work. His frustration is further compounded by the racism he faces. Will Ramanujan be able to deliver his genius to the world? If I were to ask you to name other movies about mathematicians, you may be stumped. However, films like A Beautiful Mind and The Imitation Game should have sprung to mind. Like those movies, The Man Who Knew Infinity presents us with a mathematical genius who must overcome an obstacle. For Ramanujan, his roadblock is the institutional racism and the elitism which is present at the college. The cadre of upper-crust white men who oversee the school have a natural disdain for those who they view as being beneath them, so an uneducated man from India has little chance to succeed. Ramanujan is very aware of these issues, but he tries not to let them bring him down. He is determined to get published and share his gift with others in the field, and self-confidence is contagious. Given all of that, The Man Who Knew Infinity should be a very inspirational film, right? It certainly has the makings of one and one can't help but admire Ramanujan's tenacity, but, for some reason, the movie seems determined to keep us at arm's length. From the outset, there are problems with the story. We are introduced to Ramanjuan when he is a man in his 20s and we learn absolutely nothing about his past. Was his marriage arranged? Has he been a math prodigy his whole life? He must have learned some of this stuff somewhere, but where? We are simply asked to accept the fact that he's phenomenally gifted and move on from there. Speaking of math, the movie assumes that we understand all of the math terms which are being thrown around. While Partitions are explained, everything else is simply put out there and we are left to fend for ourselves. (I have an idea of what proofs are, but as the film wore on, I began to doubt myself.) And then we have the relationship between Ramanujan and Hardy. The movie keeps telling us that Hardy mistreats his young protege, but we certainly don't see it. Hardy can certainly be cold at times, but he is, after all, British. The Man Who Knew Infinity is one of those movies which attempts to skate by on good will. Jeremy Irons is good in his role, as is Dev Patel. These are both likable actors and their presence makes the movie more inviting. Toby Jones and Jeremy Northam also shine here. The film introduces us to a relatively obscure historical figure and shows us how they sacrificed for their dreams. And yet, the movie is shockingly unemotional. These kinds of things usually get to me, but the only time that I was moved was during the pre-final-credit text which explained what happened in real life. Otherwise, we are left with a movie which has big-time credentials, but only delivers made-for-TV results. 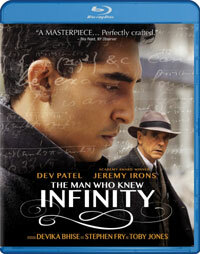 The Man Who Knew Infinity takes place at the math version of Hogwarts on Blu-ray Disc courtesy of Paramount Home Entertainment. The film has been letterboxed at 2.35:1 and the Disc contains an AVC 1080p HD transfer which runs at an average of 36 Mbps. The image is very sharp and clear, showing no overt grain and no defects from the source materials. The colors look very good and the image is never overly dark or bright. The picture shows off a definite crispness which truly adds to the depth and helps to deliver a detailed image. The Disc carries a DTS-HD Master Audio 5.1 track which runs at 48 kHz and an average of 4.0 Mbps. The track provides clear dialogue and sound effects. The bulk of the track is pretty low-key, delivering subtle stereo and surround effects. The dining hall scenes bring us some nicely defined surround action and the bombing sequence delivers palpable subwoofer effects. The Man Who Knew Infinity Blu-ray Disc contains no extra features.